Among many gifts that President Obama receives on St. Patrick's Day from grateful American workers and peasants, there was one that he liked the most. 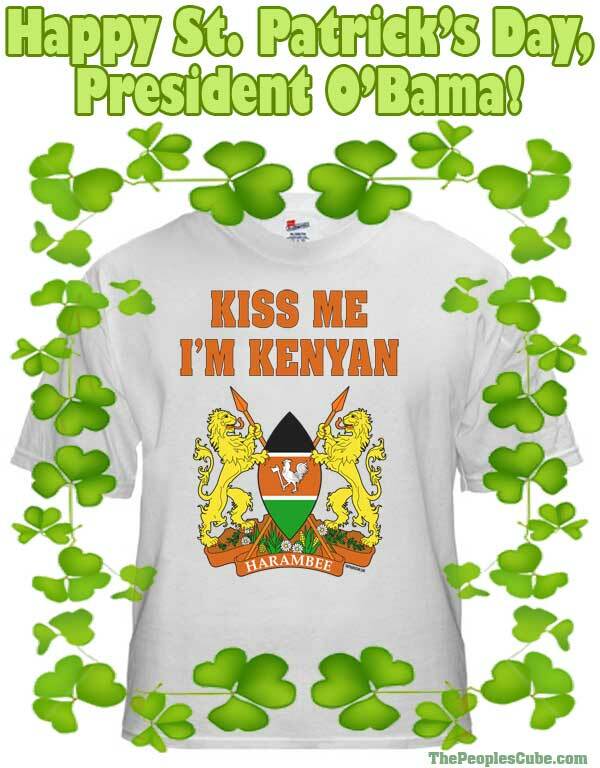 It was a T-shirt that said "Kiss me I'm Kenyan," mailed to him by an unidentified individual from the Sheriff's office in Maricopa County, Arizona. Mr. Obama chose to wear that shirt all day around the White House. It turned out to be a great conversation starter. To most of the questions Obama replied, "What are they going to do, investigate me?" followed by outbursts of cheerful laughter. A copy of this shirt is now for sale in our renovated People's Sundries Store. Wear it to show others how much you care. Why is that chicken holding an ax? If Obama had his way, I'm sure it would be holding a shovel instead. I have heard of "black Irish "
I believe the proper term would be "half black Irish". I disagree. He who is all things (PBUH) to all of his loyal subjects over which he is forced to rule NEEDS his white heritage to influence the voting Zionists in Nooo York and Flaaarida. Our dearest leader is wonderfully blessed with the gift of blarney. I am not making this up! Just Google "O'Bama Irish"
Halfrican, I heard someone say. REDEFEAT C MMUNISM Only instead of the Peoplescube.com, a circle with the obama campaign "O" for a bumper sticker, if only I had the time and the rest to make it that way. Che Guevara T-shirt costume: become a living Che T-shirt!